Lorraine had been feeling tired and stiff lately, with little energy or enthusiasm for anything. Her reflection in the mirror matched her mood, with dull skin, bags under her eyes and sagging muscles everywhere. Lorraine’s sister, however, had a different attitude to ageing. She was going to fight it every inch of the way. Lorraine wished that there was something she could do to look and feel younger but she was reluctant to try the treatments that her sister was using. Then Lorraine bumped into an old friend from university and was surprised at how young she looked. 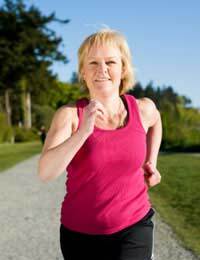 When quizzed on her secret, her friend laughing revealed her secret weapon: exercise! Keen to try it herself, Lorraine immediately joined her local gym and enrolled for a couple of weekly classes; she also started getting up slightly earlier in the mornings so she could do a brisk walk around the block before leaving for work. She found that just this alone improved her blood circulation, making her feel more energetic and bringing a glow to her skin and a brightness to her eyes. Within a few days, work colleagues started commenting on her improved appearance. To balance things out, Lorraine also bought a yoga DVD and started to incorporate stretching exercises into her daily routine, to keep her joints supple and flexible. This helped her feel more mobile and agile – and enabled her to be more active in her every day activities – even simple things like getting up off a chair were quicker and easier to do. The benefits were so obvious that Lorraine even managed to convince her sister to try some exercise instead of another surgical procedure.